A sudden thunderstorm that struck Denver on May 14, 2007 resulted in the tragic loss of a 2-year-old boy when strong currents pulled young Jose Matthew Jauregul Jr. from his mother’s arms while seeking shelter from rain and hail under the Decatur Street crossing of Lakewood Gulch. Fast rising water less than two feet deep caused the horrific accident, preventing escape from the trail portion of a twin box culvert. The situation became even more dreadful when floodwaters carried Jose Matthew a short distance downstream to the swollen South Platte River where a 3-day recovery effort ensued. 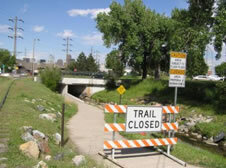 Local officials closed this section of the Lakewood Gulch trail the following day. May 14 was one of 43 recognized flood threat days, making 2007 one of the busiest seasons for forecasters in the 29-year history of the District’s local flood warning program. According to lightning strike statistics, the Denver region experienced at least 100 thunderstorm days during 2007. The 2002 Hayman fire burn area in Douglas County once again attracted more than its share of intense rain storms with 14 days setting off rainfall rate alarms. But unlike the prior year, the resulting floods and debris flows were far less damaging. While heavy rains were also common in the District, fortunately property damage from flooding was low. One day does stand out as a notable “nearby hit” that warrants reflection. That day, August 2, and others are highlighted in the flood season recap section of this article. The bolded dates denote days in which intense rainfall was measured by automated rain gages. Blue boxes designate NWS flash flood watch days and red boxes signify flash flood warnings. The team of Genesis Weather Solutions and Skyview Weather was selected by the District to provide local governments with forecasts and notifications of potential and imminent flood threats during 2007. GWS is located in Highlands Ranch and was started in 2005 by Bryan Rappolt, a 13-year veteran of the District’s long-running flash flood prediction program (a.k.a. F2P2). Skyview Weather is a Castle Rock-based company lead by Tim Tonge. Tim’s group is familiar to a number of local jurisdictions in the Denver area, having provided them with year-round notifications of approaching storms and severe weather threats. The F2P2 operates from 15 April to 15 September and has been serving the District since 1979. Information about the F2P2 can be found at f2p2.udfcd.org. The flood safety website floodsafety.com/colorado was initiated by the District and the City of Boulder in 2003. Jefferson County and others helped expand the informational coverage beyond Boulder in 2004. The following year Boulder and the District collaborated again to add more content specific to Colorado’s highest flood risk community. As this phase nears completion, you can preview the latest at floodsafety.com/boulderdemo. In 2007 the project also succeeded in producing a video that was aired multiple times by Cable Channel 8 in Boulder. The story featured an interview with Boulder Fire Chief Larry Donner. The producer, Marshall Frech, is hopeful that this work will eventually be broadcast by PBS. 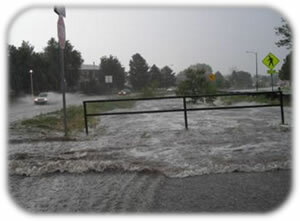 The Community Collaborative Rain, Hail and Snow network observed its 10th birthday this past July while the City of Fort Collins remembered the devastating 1997 flash flood that claimed 5 lives and caused extensive damage to the community and campus of Colorado State University. While the sad losses from this flood are still hurtful for many, it is reassuring to know that good can come out of a disaster and when good ideas get noticed, they sometimes spread like wildfire. CoCoRaHS is one of these wildfire examples. With Colorado’s State Climatologist Nolan Doesken at the helm, this unique network of volunteer observers is currently active in 26 states with 7 more projected for 2008. At this rate CoCoRaHS expects to have 20,000 observers by the year 2010. Congratulations to Nolan, to his dedicated staff at CSU, and to all the volunteers that contribute so much to our understanding of precipitation and its impacts. The District has been a CoCoRaHS sponsor since 2002 and makes routine use of this valuable information source. Be sure to read the article by Chad Kudym to see one creative way this data gets used. To learn more about CoCoRaHS visit www.cocorahs.org and consider becoming a volunteer. The Emergency Managers Weather Information Network has a reputation in some communities like Houston, Texas as a one-stop shopping location for weather information. The system can filter information and “push” user-specified high priority products using short message service (SMS) emails to cell phones and pagers, or more detailed content if desired. EMWIN can also be used for interoperable communications between emergency managers concerning non-weather situations. The main selling point, aside from its low cost, is that local emergency managers and support organizations can tailor the system to best meet their specific needs. The EMWIN project for the greater Denver area is driven by a steering committee that meets monthly. A message injector application recently passed IT security checks and is ready for operational testing. Thirty one receiver units have been distributed to 29 local governments, the Colorado Division of Emergency Management, the University of Colorado, Xcel Energy and the District. ARES Ham radio operators received necessary technical training in 2007 to assist their assigned jurisdictions. The 2008 goal will be to optimize utility, get feedback from users and make recommended changes. For more information about EMWIN visit emwin.udfcd.org. With the introduction of the Hayman gages in 2006 via a new Douglas County repeater near West Creek, the District’s ALERT system now collects data from 196 stations that include 175 rain gages, 87 stream gages and 20 weather stations. Seven new stations were added to the network in 2007. The City of Aurora Water Department installed two new hourly-reporting weather stations—one at Aurora City Hall and the other along Brighton Ditch in Weld County northwest of Brighton. Douglas County relocated four rain gages from the Hayman area to the upper Cherry Creek and Plum Creek basins south of Castle Rock (West Cherry Head, Spring Valley Road, Willow Creek and Tomah Road). A new stream gage was installed on Lakewood Gulch at 10th Avenue in Denver. By spring of 2008, two new combination rain/stream gages will be operating on Piney Creek in Aurora. 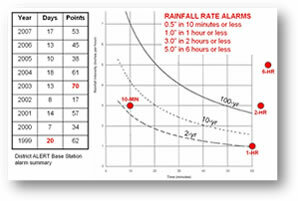 The Aurora Water Department will upgrade the equipment at the Quincy Reservoir weather station, which has been operating since January 8, 1989 and was the first ALERT weather station in the network.The Town of Parker is adding two rain/stream gages along Cherry Creek near Stroh Road and the Apache Plume confluence. The District will increase the number of rain gages from one to three at NCAR’s precipitation research test site near Marshall. This is being done to evaluate how well various types of ALERT rain gages perform and to test a new multi-sensor weather instrument available from Vaisala that measures wind speed/direction, rain, barometric pressure, air temperature and relative humidity. OneRain completed their 16th consecutive year of field maintenance services. Water and Earth Technologies (WET) provided the District with Year-2 of monthly system performance reports developed from a detailed evaluation of the District Base Station database and from a chronologic report log of all decoded ALERT messages, which includes the good, the bad and the ugly. Annual reports from OneRain and WET are available online at alert.udfcd.org. Leonard Rice Engineers (LRE) continued to support the District by web hosting real-time hydrologic models for Boulder Creek in Boulder County and Lena Gulch in Jefferson County. Two new models were developed this past year for Harvard Gulch and Goldsmith Gulch in Denver. The models activate automatically whenever flood threat notifications are issued by the F2P2 meteorologist. Basin average rainfall inputs are created from the ALERT database. In the future, the rain inputs may include quantitative precipitation estimates (QPE) from radar, and quantitative precipitation forecasts (QPF) from storm track models and meteorologists. For more information about this procedure be sure to read the article by LRE’s project manager Bruce Rindahl. The ALERT system website evolution continues with improved graphics, floodplain mapping and pertinent links, photos of past floods taken at or near stream gages, descriptive metadata and other features that will draw your eye to the most important real-time decision-support data. Chad Kudym is the architect of these and other innovations as you will discover from his article on storm verifications. A recent study completed by Don Van Wie of Telos Services, formerly with OneRain, points to a growing concern that the District’s ALERT system is nearing its capacity. Contention losses of 30% have already occurred for brief periods during intense storms. The findings suggest that a data loss rate of 63% will occur when the message rate reaches 2000 per hour. At 5400 messages per hour, the system will begin to collapse. A simulated storm developed from an actual event was used to estimate a possible peak traffic load exceeding 7400 reports per hour from the existing gaging station network. The critical rate of 2000/hr was approached on May 14 of this year according to the data analysis performed by WET. With more stations coming online, a redesign of the radio backbone will soon be needed. A number of options are available including adding additional radio frequencies to reduce traffic through existing repeaters. New protocols are being developed for ALERT data communications that hold great promise for more efficient use of the radio spectrum allocated to hydrologic uses. Given the current status of the District’s ALERT system, the District may be a likely candidate for testing these new protocols and establishing national standards. It seems like every time a heavy downpour results in flooding, inquiring minds want to know how big the flood was in terms of its frequency or its likelihood of happening again. Most floods that we experience on an annual basis are relatively small in magnitude, as compared to the 100-year (1% annual chance) flood that most people relate to and believe they understand. The news media frequently looks for some authority to confirm that a flood or rainstorm was a 2, 5, 10, 50, 100, or 500-year event, or an anomaly of greater magnitude. Since rainfall data is more readily available than streamflow, these measurements are commonly used to estimate a return period that news reporters convey to the public. For example, one TV news report about the May 14 “flash flood” on Lakewood Gulch stated that this event was a 50-year flood. If the truth be told, it wasn’t even close. However, a nearby ALERT rain gage did measure a very short intense burst that approached the 50-year (2% annual chance) magnitude. To equate this to a 50-year flood on Lakewood Gulch is completely misleading, but it happens all too often. By the end of 2007, the Lakewood Gulch stream gage at 10th Avenue in Denver measured three other events of equal magnitude. When describing flood magnitudes to the public, relate the subject event to a past flood whenever possible. Avoid mentioning peak discharge. Lay people seldom understand flow rate units of CFS, CMS or GPM. When pressed to estimate a return period, consider relating the event in question to the 100-year flood as a fraction or multiple, or state that the water level rose to within 4 feet of the 100-year flood or exceeded the 100-year flood by some known amount at a specific location. Never equate flood frequency with an observed rainfall intensity and corresponding return period, unless you are talking about a flood that occurred in a parking lot with a person that understands exactly what you are talking about. Events like Hurricane Katrina and worldwide debates over climate change have made us all very sensitive to weather extremes and their potential catastrophic impacts. As engineers and subject experts on floods, we should first educate ourselves about extreme events and then work with communication professionals to more effectively educate others about the true risk of flooding and what individuals and families can do to protect themselves. April precipitation made for an early start to the flood season, causing notable rises in flood control reservoir levels well before the normal snowmelt runoff period in May and June. The April 23-24 storm system that delivered between 2 and 3 inches of rain over a large portion of the District prompted forecasters to issue the first messages of the year. While April is not considered a high streamflow producer for the District, a remarkable number of gaging stations recorded annual peaks that month. Monday-Wednesday, April 23-25 With CoCoRaHS distinguishing the 24-hour rainfall period ending April 25 at 7 AM as the wettest day in their short history from a national perspective, volunteer observers from within the District contributed their fair share with many reports exceeding 2 inches. The first incident of flooding reported to the District occurred during the evening hours of April 24 sometime after the newly rehabilitated Leyden Dam in Jefferson County began releasing flows from its principle outlet. Immediately downstream of the dam Colorado Highway 72 (Indiana Street) was overtopped by less than a foot of water. Law enforcement officers were on scene early to slow motorists. 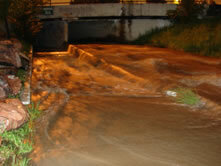 The rainfall was not intense, but the large amount of rain combined with snow from elevations above 6,000 feet produced significant runoff District-wide with annual peaks occurring at many locations including Ralston, Leyden and Van Bibber Creeks in Arvada and Jefferson County; Lakewood Gulch in Denver; Westerly Creek and Granby Ditch in Aurora; Englewood Dam and Holly Dam in Arapahoe County; Slaughterhouse Gulch in Littleton; Cherry Creek in Denver; Sand Creek in Commerce City; and the South Platte River in Adams County. Flows on Cherry Creek and Plum Creek in Douglas County were also well above normal. This day ended in tragedy with the loss of a 2-year-old boy that became trapped with his mother under the Decatur Street crossing of Lakewood Gulch in Denver. Earlier in the day the NWS had issued severe weather watches and warnings that included the possibility of heavy rainfall. Most of the storms that day were moving too quickly to cause much concern by way of flooding. The intense storm that developed suddenly over downtown Denver around 7 PM produced very heavy rain and hail. The rain gauge at Denver Wastewater Management (2000 W. 3rd Ave.) measured an inch in just 12 minutes. Elsewhere, flooding along Goldsmith Gulch near Bible Park resulted in a failed rescue attempt of a teenage boy by Denver Police. The boy was not found and was assumed to have escaped the floodwaters somewhere between Yale and Iliff Avenues. A police officer was pulled from the strong current by fellow rescuers and was treated for hypothermia. Media coverage of both incidents was extensive. Annual flood peaks were measured along Harvard Gulch and Goldsmith Gulch in Denver; Westerly Creek in Denver; Sable Ditch in Aurora; Bear Creek in Sheridan; and the South Platte River in Denver. Lakewood Gulch at 10th Ave in Denver rose approximately 3 feet between 8:00 and 8:15 PM hitting a peak gage height of 4.18 feet. This new stream gage recorded nearly identical water levels on three other days in 2007—April 24, May 1, and August 3. Peak flow estimates at Decatur Street made by Leonard Rice Engineers and the U.S. Geological Survey ranged from 400 to 550 cfs. To put these numbers in perspective, a master planning study completed in 1979 estimated a 2-year (50% annual chance) discharge of 800 cfs that would increase to 1,900 cfs with a fully developed drainage basin. Design flow rates of 7,200 and 11,400 cfs were calculated for the 10 and 100-year events. Between 1981 and 2007, annual peaks for Lakewood Gulch ranged from 300 to 1,200 cfs according to data from a USGS crest stage indicator gage. The fact that floods like the May 14 event on Lakewood Gulch happen almost every year does not lessen the danger posed by fast moving water. Although the water depth on the trail was less than two feet, the quick rising floodwaters and high flow velocities of 10 to 12 feet per second made escape impossible for a mother and her child on this particular day. This tragic accident will not soon be forgotten and will hopefully serve to remind others that gently flowing streams can turn deadly with little or no warning. Celebratory fireworks are always a most welcome and anticipated Independence Day highlight, but in the District the 4th of July would not seem complete without a grand finale lightning show accompanied by localize flooding. This year the T-storm arrived in Denver shortly after the pyrotechnics ended with the Cherry Creek at Steele Street rain gage setting off a half-inch in 10 minute rate alarm at 10:13 PM. A maximum rainfall total of 1.4 inches was reported by a CoCoRaHS observer. A line of strong thunderstorms extending from the Hayman burn area in southwest Douglas County to Aurora dumped between 2 and 2.5 inches of rain at a number of locations prompting the NWS to issue a flash flood warning for Aurora. The largest rainfall measurement of 1.93” occurred at the Murphy Creek Golf Course ALERT gage where the stream gage also recorded its annual peak. The late afternoon storm lasted approximately 90 minutes. It’s a rare day when District staff gets a phone call from a NWS forecaster at 3:45 AM concerning the potential for flash flooding from a deep warm layer with surface dewpoints in the 60’s. That forecast sounded familiar to a day exactly 10 years earlier when a flash flood in Fort Collins claimed 5-lives and resulted in a presidential disaster declaration. A subsequent flash flood watch was issued for the entire District and the anticipated storms arrived in time for the late afternoon rush hour. The storms formed over the southern portion of the District and moved very slowly to the north producing heavy rainfall of 1.5 to 2.5 inches in 30-60 minutes and triggering alarms at five ALERT gages between Littleton and Adams County. The most intense rainfall measured at the District’s Diamond Hill office set off four alarms between 5:47 and 5:54 PM. This storm activity prompted the NWS to issue flash flood warnings for Denver, Arapahoe and Adams counties. While traffic disruptions were common, flood losses appeared minimal according to news reports. A man was killed by lightning on a park trail in Jefferson County north of Morrison. This day had the potential of being the biggest flood day of 2007 for the District. Once again, luck favored the District with storms that caused only minor street flooding. An area northeast of Brighton was not as fortunate, however, being hit by rainfall that warrants reflection. August 2 also brought Fort Collins a near repeat of the 1997 flood when the southern portion of the city was hit by a heavy rainstorm that dumped over 5 inches in 3 hours. District rainfall was relatively light in comparison to nearby storms with the largest reported amounts being just over an inch. Heavy rainfall in Denver and Aurora caused some nuisance street flooding and set off gage alarms near Stapleton and Buckley Air Force Base. A large rainstorm northeast of Brighton went relatively unnoticed while media reports focused on the flooding situation in Fort Collins. The monster storm in Weld County (see figure) was far more impressive than the Fort Collins event covering a much larger area and producing more than 6 inches of rain at its core with a sizable area receiving over 3 inches. Interesting also is how this storm centered itself almost perfectly between the rural towns of Ft. Lupton, Hudson, Keenesburg and Platteville. The numbers represent storm rainfall totals in inches. The yellow highlighted amounts are ALERT gage measurements and the white highlighted amounts were reported by CoCoRaHS observers. The colored pixels represent radar estimated amounts. To emphasize the hydrologic significance of this event, the figure includes an inset map of equal scale depicting the 14 square mile Lena Gulch basin in Jefferson County. A recently completed master plan update for Lena Gulch shows that a very damaging 500-year flood would result from a 2-hour basin average rainfall of just 3.8 inches. Had this Weld County storm occurred over Lena Gulch or any other developed portion of the District, breaking news stories that day would have certainly included metro Denver. Hopefully events like these can serve as a reminder that “unusual” rainstorms are not all that rare and we should remain diligent in anticipating the next one. This sudden storm hit the southern part of Boulder producing upwards of 1.5 inches of rain between 5:00 and 5:30 PM, and causing alarming water levels on Bear Canyon Creek. The small stream runs between the east and westbound lanes of Table Mesa Drive west of Broadway (Colorado Highway 93). The above photo shows that roadway culverts had reached their capacity. 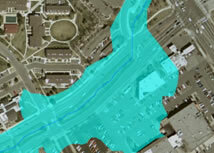 Another inch of rain could have resulted in flood damages to adjacent properties as shown by the aerial photo depicting the extents of the 100-year floodplain. The intersection of Table Mesa Drive and Broadway is in the upper right corner. Every year the District experiences at least one nocturnal boomer. This one happened unexpectedly just after midnight waking residents in Broomfield, Boulder and Jefferson counties. The ALERT repeater station on Blue Mountain was severely damaged by lightning. Radar precipitation estimates of 1.5 inches were confirmed by surface measurements. The rainmaker apparently did not get the memo because this event happened nine days after F2P2 forecast services ended for the year. Portions of northeast Boulder received more than two inches of rain from this late season finale. 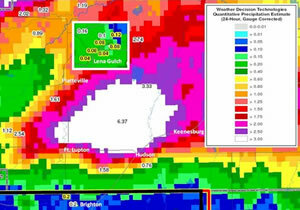 According to radar precipitation estimates, the Town of Superior may have experienced equally as much. The intense downpour in the Gunbarrel area set off an ALERT rainfall alarm at 7:26 AM and the water level in the detention basin there rose 1.7 feet. Intense rainfall was also measured at Leyden Lake in Jefferson County between 9 and 9:30 AM, ending the season at the same location where the action began precisely 5 months earlier on April 24. Past issues of Flood Hazard News contain tables that list annual peak flows and maximum gage heights recorded by the ALERT system for each respective year. New record high water measurements are also identified in those tables. With some gage records now exceeding 20 years in length, the historic data is becoming increasingly significant while the stream gauging network continues to expand. Consequently, the past practice of publishing a peak flow table in this newsletter has been replaced by making available a more complete online version of peak flow/high water records from 1986 to present at alert.udfcd.org. This is a work in progress, so please be patient and send us your suggestions. Some of the older records are the most difficult to compile. The District recognizes the efforts of IS/FWP student intern Stephanie LaCrue in compiling this important historic record. Readers wanting more information about past storms and floods in the Denver region should visit the Flood Warning Program Bulletin Board webpage. The District continues to expand services to local governments, engineering consultants, contractors and the public through its development of GIS-based information and web services. E-Library enhancements will be a continued focus through 2008 and beyond. Much is already available from the District’s website, which is enthusiastically administered by our IT consultant Derrick Schauer. Nearly all District studies and reports can be downloaded from our website by clicking on the publications tab and making your selection. Future plans include developing better map-driven “drill down” interfaces that allow users to more easily locate and download District publications, construction as-built drawings, floodplain maps, project status reports, historical flood information, hydrologic and hydraulic models (H&H), maintenance eligibility status, monument surveys, and other useful products. The District’s IT infrastructure is keeping pace with these needs thanks to Derrick’s near full-time efforts. His support of the District LAN and centralized file servers, combined with his Internet talents have been recognized by the District and with those needs continuing to grow, the District has established a permanent staff position to be filled by Derrick in 2008. Congratulations Derrick and welcome to the staff of the Urban Drainage and Flood Control District.